When Arizona became a state in 1912 the federal government set aside more then 10 million acres of land to be held in trust to support public education. Today we still have 9,300,000 acres of this state trust land. The land is to be sold and leased to support public education. Now if you ask me for my Libertarian view the state could give all this land to the people who own it (which is the 6 million people that live in Arizona) and every person in the state would have 1.5 acres of land. Wow! That would eliminate the homeless problem. I should get more information on this state trust land. A good starting point would be Mark Winkleman the guy who wrote this article. 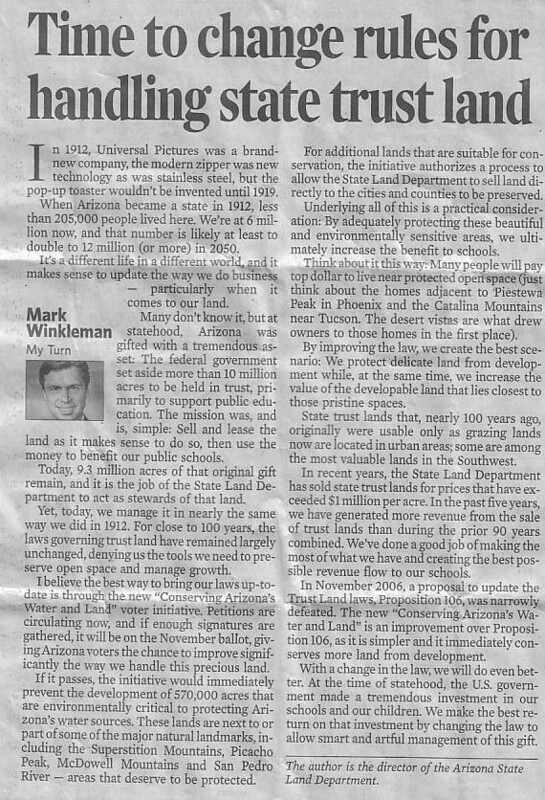 And as it turns out Mark Winkleman is the Director of the Arizona State Land Department. The Territory of Arizona was established on February 24, 1863, by an Act of Congress. This Act granted sections 16 and 36 of each township for the benefit of the Common Schools. Endowment of public lands for educational purposes was a practice established by the Northwest Ordinance in 1787. Congress quickly recognized the value of the land and the importance of public schools to a developing nation. The State Enabling Act, passed on June 20, 1910, allowed the Territory of Arizona to prepare for statehood. In addition to the previously designated sections of land, the Enabling Act assigned sections 2 and 32 of each township to be held in trust for the Common Schools. The needs of other public institutions were considered by Congress, and through the Enabling Act, more than two million additional acres were allocated for their use. What a rip off the b*st*rds charge us money to use land we own!!! DO YOU NEED AN ASLD RECREATIONAL PERMIT? All recreational activities (execpt hunting and fishing) require an ASLD Recreational Permit. Commercial recreational activities or recreational events that charge a participation fee, i.e. hot air balloon rides, jeep tours, hayrides, horseback rides, bicycle races, equestrian events, ultra light aircraft, etc., may be considered under an ASLD Special Land Use Permit, but not under an ASLD Recreational Permit.